We’d love your help. Let us know what’s wrong with this preview of Papa Goose by Michael Quetting. 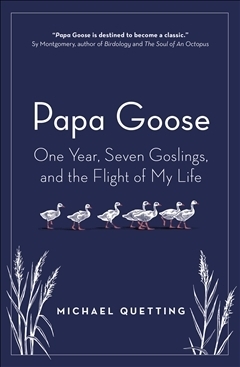 In Papa Goose, Michael Quetting shares the hilarious and moving true story of how he became a father to seven rambunctious goslings―and the surprising things he learned along the way. Starting right at the beginning, with the eggs, his journey takes him from the incubator all the wa The charming true story of one man’s journey to raise seven goslings in the name of science. To ask other readers questions about Papa Goose, please sign up. Certo il racconto di questo ricercatore non trasmette la bellezza e la gioia della natura e degli animali e del loro studio con l'intensità ineguagliabile di cui è stato capace Konrad Lorenz, ma è comunque gradevole da leggere per chi è appassionato di uccelli e di volo e per chi ha vissuto la fortunata e coinvolgente esperienza di veder nascere e far crescere delle ochette come loro mamma. Mi ha ricordato da vicino uno dei film che preferivo da ragazzina: Fly away home (L'incredibile volo), dir Certo il racconto di questo ricercatore non trasmette la bellezza e la gioia della natura e degli animali e del loro studio con l'intensità ineguagliabile di cui è stato capace Konrad Lorenz, ma è comunque gradevole da leggere per chi è appassionato di uccelli e di volo e per chi ha vissuto la fortunata e coinvolgente esperienza di veder nascere e far crescere delle ochette come loro mamma. What child, upon learning about imprinting phenomenon in baby birds, has never mused "What if I got a hatchling to imprint on me?" Folks, Michael Quetting got to live out our fantasies, and it's simultaneously as adorable as and a lot messier than our blithe imaginings. Read about his year living in a small camper in Germany raising greylag goslings who think he's their papa. The writing could have been a bit more polished, but the weirdest aspect of the book is the bizarre dialect the locals se What child, upon learning about imprinting phenomenon in baby birds, has never mused "What if I got a hatchling to imprint on me?" Folks, Michael Quetting got to live out our fantasies, and it's simultaneously as adorable as and a lot messier than our blithe imaginings. Read about his year living in a small camper in Germany raising greylag goslings who think he's their papa. The writing could have been a bit more polished, but the weirdest aspect of the book is the bizarre dialect the locals seem to speak when communicating with Quetting -- are they members of a Quaker community, or is it just an unusual way to translate from the original German? I received an advanced reading copy of this book from the publishers. Interesting read about a man who imprints himself on 7 goslings in order to use them for some flight recordings. I learnt a lot about Geese and what it takes to imprint on them properly. It was also fascinating to read how he spent a lot of that time with just the Geese and only the occasional human interaction. Be prepared to find out Geese poop looks a certain colour depending on their food. There is a fair bit of poop. This b I received an advanced reading copy of this book from the publishers. This book will be good for animal lovers - to see the interactions between man and bird but I was constantly questioning the choice to raise them with a human in enclosures rather than in the wild. I struggled with some of that part of the journey at times. Sweet but insubstantial. A touching tale about a scientist raising 7 goslings he has imprinted upon from hatchlings. All in the name of experiments into wind speed, avian interactions with weather during flight and, potentially, the future with monitoring taking place from the Russian space station. Largely a story about Micha (the author's nickname) and how the goslings brought him back to equilibrium after his divorce. I didn't cry. A scientist at something of a crossroads in his personal life, sets out on an intensive science experiment, learning a lot about nature, and himself. He imprints on seven goslings, and becomes their father, in the hope of getting new flying data from them. The experiment is full of ups and downs and an awful lot of goose dropping. It's a sweet, and funny little book with interesting scientific detail and plenty of popular philosophy designed to make us think about our priorities. Imaginary conversations with juvenile geese. Who knew that geese can fly upside down? Raising geese so they imprinted on him the author relates their upbringing and his efforts to recruit them to science. Unfortunately geese are not such great scientific subjects, at least as flying weather data collectors. An experiment where a man raises a flock of geese from eggs, teaches them to fly, attaches tracking devices, and then releases them into the wild. An amazing experiment of sorts, where the author handraised a group of goslings, with the aim of training them to fly alongside his glider, to assist in gathering weather data. A totally different, true story and a very easy read. father figure to greylag geese as part of a project that aims to use birds to collect flight and weather data. Seven goslings hatch and delicious days are spent splashing and swimming in lakes, snoozing in meadows, and avoiding predators and occasional ultralight mishaps. Quetting has his hands full . He marvels at how “brutal, yet wonderful, nature is” and demonstrates that nature, and the creatures we coexist with, are fundamental to the health and well-being of mankind.